Our Jubilee rain ponchos are perfect for keeping customers dry during the Diamond Jubilee celebrations. Personalised with your Company's branding and logo for the best exposure assured - the inline pantone colour choice slips have a printable and customised option for branding, artwork and your logo in full digital colour. Why not hand these Jubilee rain ponchos out with your invoices and get your name out and about during Queen Eliabeth II's Diamond Jubilee? 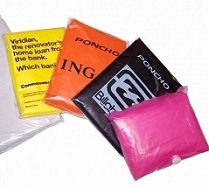 For a FREE QUOTE, please fill in the form regarding our Jubilee rain ponchos and we'll be able to help you. Why not have a look a our The Queen's Diamond Jubilee Products department for more business gifts?